Captivating artwork, compelling stories, and interesting facts combine in an exciting new collection of cards from the creators of The Action Bible. 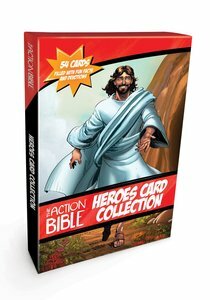 The Action Bible Heroes Card Collection includes over 50 luxuriously illustrated Bible heroes on high-quality, individual cards. Flip each card over to find more exciting artwork and a brief biography that will truly take children on their own adventure of discovering each Bible hero and finding how they can connect to God from the hero's story. Interesting facts, engaging questions, and references to finding more information about each hero in The Action Bible and The Action Bible Storybook (when applicable) are included. An additional card is provided with ideas to keep kids engaged. Packaged beautifully in one, easy-to-use box, these cards will be treasured by families for years as they study and engage personally with the heroes from God's Word. About "The Action Bible Heroes Card Collection: 54 Cards Filled With Devotions and Fun Facts"
Brazilian-born Sergio Cariello has been an accomplished artist since childhood, drawing a regular comic strip for his city's newspaper by age 11. He later worked for Marvel Comics and DC Comics. He attended the Joe Kubert School of Cartoon and Graphic Art as well as the Word of Life Bible Institute. He currently resides in Florida.